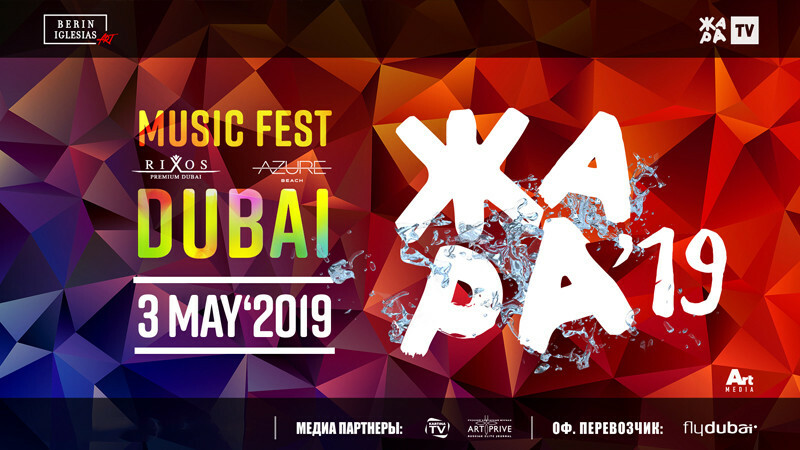 Music Festival ZHARA'19 in Dubai in Rixos Premium Dubai JBR buy tickets online. Delivery of tickets for the event Music Festival ZHARA'19 in Dubai. Ticket Pick-up Information will be determined at a large stage. Zhara TV and Berin Iglesias Art present an unforgettable and exciting international festival "Zhara". The festival will be held in Dubai on the 3rd of May on the territory of one of the best hotels in the region - “Rixos Premium Dubai JBR”, which is located on the JRB beach. The event starts at 20:00, doors open at 18:30. The duration of the concert is 4 hours - until 0:00. The official passenger carrier of the event - "Fly Dubai" airlines. An open-air stage will be specially built right next to the Persian Gulf Shore. It is a tradition of the Brand to present a multi-hour show by great Artists, original choreographic performances, unforgettable atmosphere and live sound! May 3: Grigory Leps, EMIN, Vremya i Steklo, Leonid Agutin, Valeria, Ivanushki International, Maruv, Artik & Asti, Alexandr Panayotov, Olga Buzova, Albina Janabaeva, Slava, Rodriguezzz, Julianna Karaulova and Elina Chaga. “Zhara” festival guests are offered seats at the tables, as well as tickets at the dancing area and a fan zone near the stage. There will be two bars with a voucher system for buying drinks and food. SILVER (up to 8 guests/table, including 1 bottle of champagne, 1 bottle of "Gray Goose" Vodka). GOLD (up to 10 guests/table, incl. 2 bottles of champagne, 1 bottle of "Gray Goose" Vodka). PLATINUM (up to 10 guests/table, incl. 2 bottles of champagne, 1 bottle of "Magnum Gray Goose" Vodka). ARTIST GOLD (up to 10 guests/table, incl. 2 bottles of champagne, 1 bottle of "Magnum Gray Goose" Vodka). ARTIST PLATINUM (up to 10 guests/table, incl. 2 bottles of champagne, 1 bottle of "Magnum Gray Goose" Vodka). ARTIST VIP (up to 8 guests/table, incl. 2 bottles of champagne, 1 bottle of "Magnum Gray Goose" Vodka). All tables will be served with fruit plates and light meals. À la carte service will be available. May holidays traditionally open summer season's open-air events. "Zhara” festival in Dubai has set a high bar: top-level artists, excellent location, unforgettable moments and thousands of satisfied guests will open a new chapter in the history of the brand on May 3rd.